A fascinating collection of Einstein’s observations about life, religion, nationalism, and a host of personal topics that engaged the genius’s intellectIn the aftermath of the First World War, Einstein writes about his hopes for the League of Nations, his feelings as a German citizen about the growing anti-Semitism and nationalism of his country, and his myriad opinions about the current affairs of his day. In addition to these political perspectives, The World As I See It reveals the idealistic, spiritual, and witty side of this great intellectual as he approaches topics including “Good and Evil,” “Religion and Science,” “Active Pacifism,” “Christianity and Judaism,” and “Minorities.” Including letters, speeches, articles, and essays written before 1935, this collection offers a complete portrait of Einstein as a humanitarian and as a human being trying to make sense of the changing world around him. 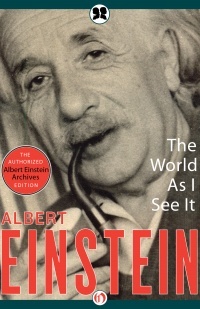 This authorized Philosophical Library ebook features a new introduction by Neil Berger, PhD, and an illustrated biography of Albert Einstein, which includes rare photos and never-before-seen documents from the Albert Einstein Archives at the Hebrew University of Jerusalem.